I’ve lived in LA my entire life. I grew up in Whittier (45 minutes-ish from the city) and went to Whittier College. After college I moved closer to the “city” into West Hollywood. I hopped around that area for a while with a short stint on the West Side (aka doucheville. Did I say that out loud? I’m sorry people who live out there. You are not a douche. I’m sorry I suggested you were. For non-LA-ians the “West Side” is the side of the city that hits the ocean.). 7 (or was it 8) years ago Riggins and I ditched what I consider the “fun” side of LA to act more grown up and come to the “valley.” Now we live about 5 minutes from Griffith Park. Although I’ve never lived further than an hour from the giant chunk of wilderness (or as wilderness-y as we get here) I have never, until this weekend, been on the park’s hiking trails. It’s a little ridiculous of me but my excuse is, I hike to go out with Riggins and if I’m going to do that I want to go somewhere that he can be off leash without me being yelled at by other hikers. That means Runyon. This past weekend Bud was back with us. Bud has become a fickle fellow and has decided not to like any other canines. That really cuts down on where I can take him to poop him out and he NEEDS to get pooped out or he will spend his time beating up poor Riggins. 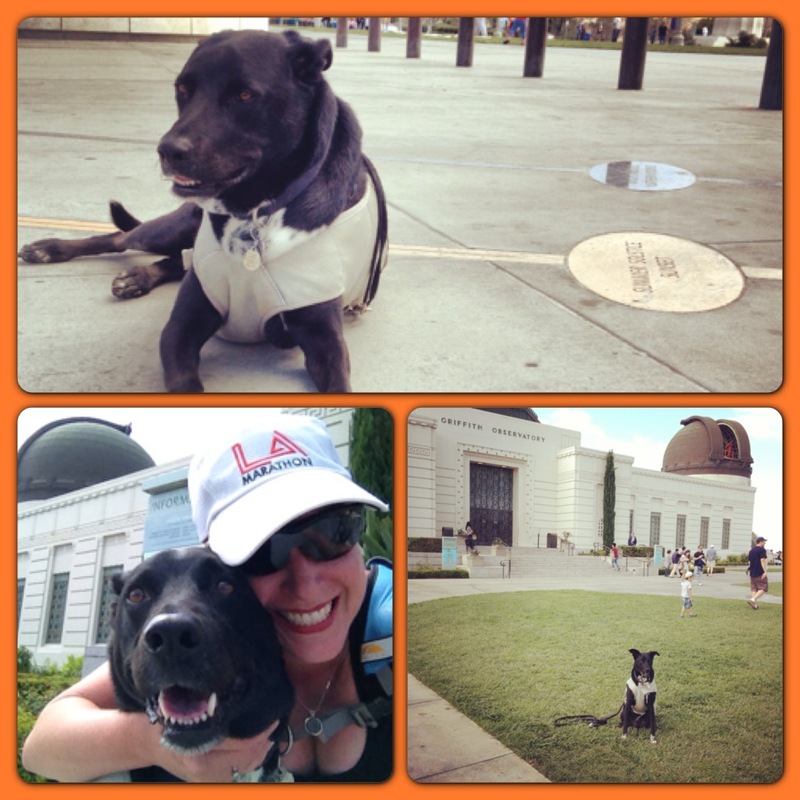 So minutes after he was dropped off I leashed him up and set off for Griffith Park. I knew there was a trail head behind the Observatory so decided to give it a shot! The park is very large so let me give you the Wendy tips on what is where. The entrance off of Forest Lawn using Zoo Drive is the north most way into the park. This road (when not under construction) will take you to Travel Town (train museum – a hit with young boys everywhere), the steam train (which is rarely open so look it up open day/hours first if you wanna go), the golf course, the Los Angeles Zoo, and the Gene Autry Museum. There is also a camp tucked away up there. It’s a good place to see horses as there is a horse ring thing and the equestrian center is just a tunnel away on the other side of the LA River and 134 freeway. There are 3 main entrances on the south side of the park off of Los Feliz Blvd. Starting from the 5 and heading west, the first is Crystal Springs. This will take you immediately to the Wendy Train (named by my nephew Logan since it is a train and he gets to go there when he visits me) and pony rides. Keep driving and you will hit thecarousel and the best (in my opinion) playgrounds in the park. This is the “kids” entrance and Crystal Springs will eventually link up with Zoo Drive (honestly all the roads link up so when they are open you can keep driving in loops if you want). The next entrance is on Hillhurst. It will take you to the Greek Theatre and to the Observatory. The final entrance (well official entrance) is further down Los Feliz on Fern Dell. This road will take you to the Ferndell trail (known to Californians because of Huell Howser) and the Trails Cafe. Bud and I parked near the observatory and headed off. It was hot and being a short snout breed I was a little worried about Bud overheating. He’s a ball of energy, so it was no problem (I was suited up and prepared for a long hike. Later this week I’ll post what I bring with me in my backpack while going out with the dogs.). The path is wide with an easy grade. We found a magical little spot called, Dante’s View. Named for the gentleman who started the garden, it is a sweet oasis on a mountain with wonderful views. It has a number of steps making it tri-level with benches to sit down and chill at. In addition there is water available for both dogs and humans. We went a little further until I figured Bud had chilled out and then we headed home. 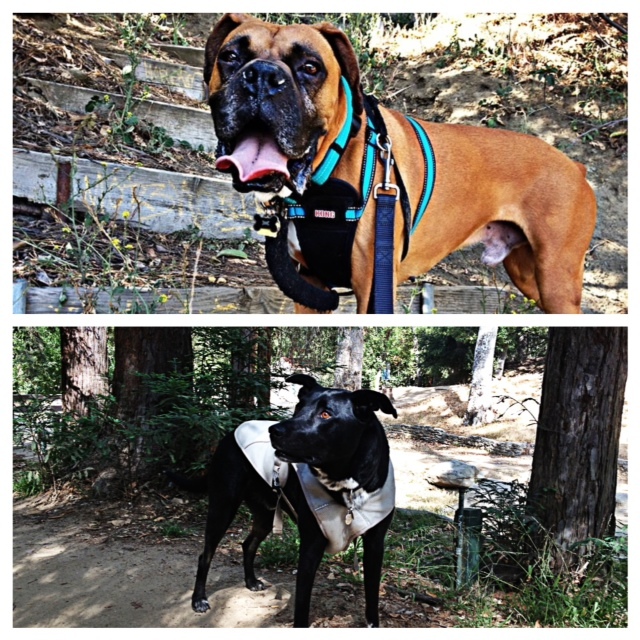 Since Bud isn’t great off leash and isn’t great around other dogs the Griffith Park hike was PERFECT for him. Although a popular path (which I like … I won’t go on paths that aren’t well-traveled unless I’m hiking with another human) it thins out the higher you go and there aren’t a ton of other dogs around. When we drove home I took the other road looping around and coming down Fern Dell. I noticed that this was a very popular place to park so I assumed it was a good place to hike! I decided Bud and I should try it the next day. After waking and suiting up with stocked backpack and leash, Bud and I said goodbye to Riggins and headed off. This trail was adorable. The first part is a man-made trail that includes a fun garden and stream (sadly the cute path was closed when we were heading back to the car … a tree had fallen down across the path and Fern Dell … it was a bit of a traffic mess). After you pass through the cute little fairy land you can keep hiking. The two roads available will circle around, merging together and eventually take you up to the Griffith Observatory. Bud and I took our time heading up and hanging out at the top forcing us to have to run down to get home in time for his folks to pick him up. I had a feeling Riggins would love the Fern Dell trail so I decided to take him the next day. It won’t be something he can do when it gets hotter. None of the Griffith Park trails (and there are miles and miles of them … I’ve just scratched the surface) have much shade and the dirt can get hot on paws very quickly with the direct So. Cal. sun. Much to Riggin’s dismay I slapped on his cooling vest (it always takes him a few minutes to get use to the fact that it isn’t coming off) and took him up the mountain. He was in HEAVEN. I did unleash him so he could go at his own pace (which was usually faster than me). I was waiting to get yelled at by fellow hikers … which would be allowed as they would be in the right and I was in the wrong … but you know my theory on hiking on leash. Riggins thought he was the king of the mountain strutting up to humans to get love and attention, head held high as he passed dogs on leash, and policing the folks that thought they could go off the path. When we got close to the top I put his leash back on. The Observatory is always busy but being a holiday weekend it was packed. Unlike Bud, Riggins was willing to “sit and stay” so I could take more pictures of him. In fact people gathered around and stared to watch the dog sit and not move as I would say, “Look at me … stay …. ” walk away from him and snap some photos. He was a pure gentleman and oddly well-behaved doing exactly what I asked. Honestly I think he liked putting on a show and was happy people were watching him. I’m so excited to have discovered the fun paths just minutes from my house and I’m kicking myself for not being open to checking them out earlier! 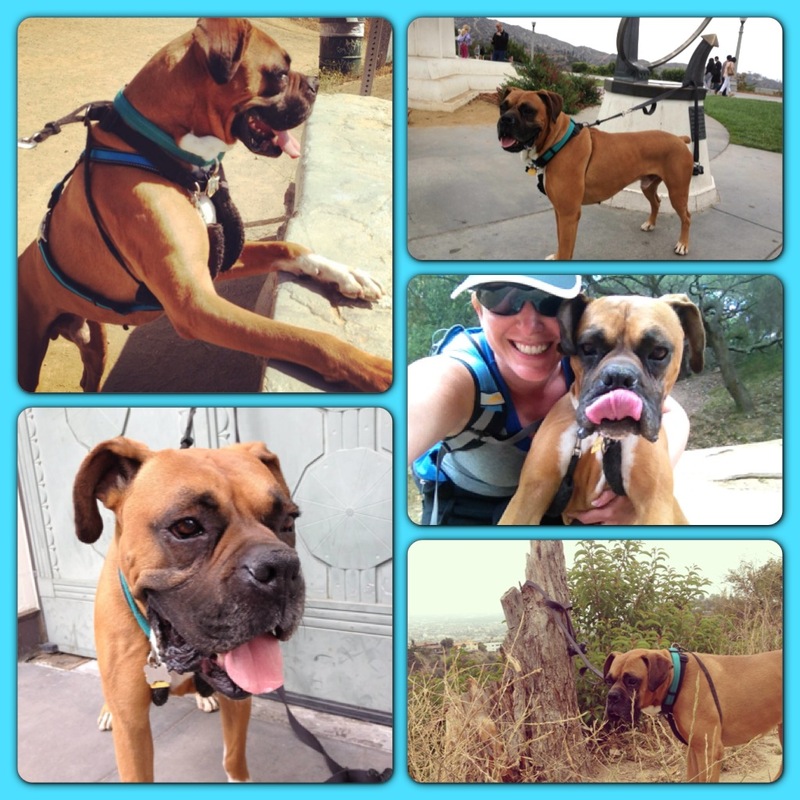 Please enjoy the video below of Riggins on the Ferndell trail …. 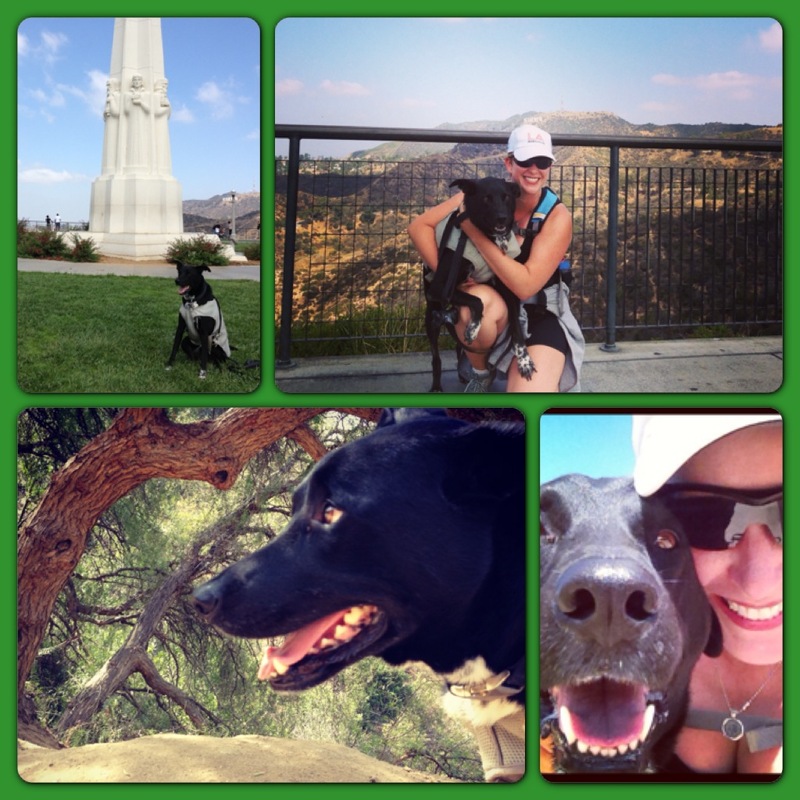 Great information about Griffith Park!! I love learning about places in LA. I will be out there in July for a few days and am hoping to do a hike either in Grifith Park, Runyon or the Whittier hills.